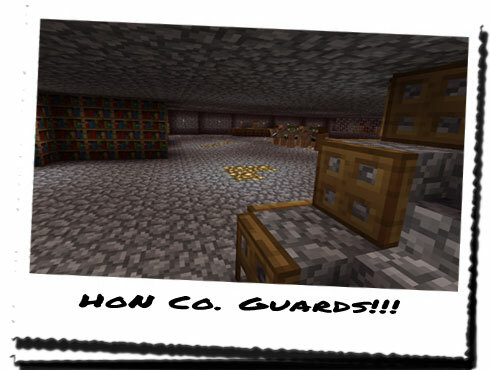 When I had originally entered the construct, I had made a preliminary sweep of the area to ensure that we wouldn't be ambushed or attacked by any HoN Co. guards that might be lurking somewhere in the shadows. After ensuring we were safe, I made my way over to what I considered to be a secretary's desk. It was positioned in such a way it was hard to see it as anything else. Lifting the hatch up to get through to the bookcases behind, I began to go through the sparsely stacked shelves. Most of what I could find was guard movements and duty rotation times. I had however verified that this place belonged to HoN Co.; every single file I found had the iconic pickaxe symbol adorned on the spine and the front. There were a few additional files that initially caught my eye, but they too contained useless information... There was nothing about how this place was constructed, or how long it had been standing, or more importantly, the purpose it served. Making one final check for anything that might be hidden about the desk, I emerged from the hatch and looked around at the others; they too were searching for anything that might help us, but it seemed there was nothing found yet. Then I heard a noise... It was badly muffled, and it took a lot of straining to pierce through the sound of molten rock falling through the chambers around me. Voices... I could hear voices. One voice; it sounded loud, authoritative... I couldn't make out what was being said, but I had an idea for where it could be coming from. Looking around behind the cubicle containing the bookcases, I found a set of steps leading down, likely to another level of the construction. Amie had remained with me the entire time and had also noticed the voices too. I pointed towards the stairs and she made a thumbs-up motion. She went over to COLUS and presumably told him what we had found, as he soon looked at me and came striding across. "What have you found? Does this place belong to HoN Co.?" I nodded and whispered back that I had found a series of guard duty files with the HoN Co. symbol stamped on them. It was definitely a HoN Co. operation here, and then I pointed him in the direction of the stairs. Then Amie pointed up above the stairs and I realised there was in fact two sets of stairs, one leading up, and one leading down, both winding around the central lava flow. "You two check the upstairs, I'll check the downstairs. If you see anyone, don't engage them, come back down and inform me. We need to remain undetected throughout. Got it? Good!" COLUS disappeared down the stairs that led to a lower floor, whilst I I began to take the others leading up. Readying my blowpipe, I neared the top, my heart racing like it never had before. Poking out my head, I looked all around and found nothing... This floor was even more deserted than the previous one. Only five main pillars were visible, also wrapped around the lava flows and presumably holding up the large flat stone disc we could see from outside. I came out all the way onto the top, Amie close behind me, and looked around for anything that could indicate what this place was used for. But there was nothing; no desks, bookcases, chests, nothing... I motioned for Amie to head back down and quickly followed her. Once back on the first floor, I went around to the back of the central column and found another set of stairs, these also led down. Maybe the lower floor was split into two... Descending them cautiously, I was surprised to find the lower floor considerably more populated with stuff than the first! A strange gated off area to my left instantly drew my attention, and I could make out strange figures through the bars. Withdrawing slightly in case they were guards, I stopped and continuing searching when I realised they were dummies! What were they doing down here...? I could make out another desk and a large chest through the iron bars, and was about to quietly head over to them, when a loud, booming voice stopped me dead in my tracks! I thought I had been caught, and remained motionless as it continued, until I realised it wasn't addressing me. Taking this opportunity, I headed back up the stairs, where COLUS had already returned to. "I think you're right about this one. They're are guards down there, quite a few. I'm pretty sure they're not aware of us just yet, so we had better head out pretty quickly." "But we still don't know any more about this place! I thought we came here to learn of its purpose...?" "We did, but with those guards down there making life very difficult for us, I don't see what other choice we have... There is a large library down there which could contain the information we need, but it'd mean walking past the guards, and I doubt they'd kindly oblige us that..."
I watched them from the corner of the step, listening in on the main guard who seemed to be addressing the rest. There were about twelve of them, maybe more, and the one talking wore slightly different armour to the rest. Not the armour of the Elite thankfully, but different none the less. "We have reports that the rebels have set up a camp in the Nether close to us, and the big wigs back in Minecraftia want us to deal with them. 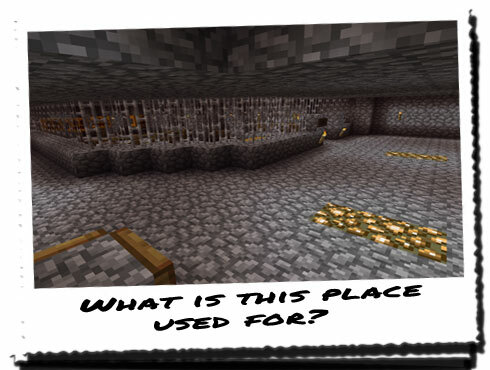 If we find their camp, we find their way of getting into the Nether, and we find their base. From here, we'll split into four groups of four; the first two will begin their patrol routes around this place to act as our eyes, one group will act as the scouts, and will hunt out the rebels. The rest will remain here with me until rotation. Now get going!" I shot back up the stairs and quickly told COLUS what I had just overheard. His eyes bulged as I told him that the guards were coming up the stairs, and didn't say anything for a few seconds. "We can go to the top floor. There's no-one there, and I doubt they'll come looking for us there either." COLUS nodded and we all headed up the stairs, Amie in the lead, and COLUS at the end. My heart was still racing and it hadn't slowed down since entering this place. Now, we were literally hiding in the same building as the enemy!